(Bloomberg Opinion) -- Japanese companies, after years in the low-growth doghouse, have gained a reputation for being ambitious acquirers. Nomura Holdings Inc. should be equally aggressive — in scaling back. The nation’s largest brokerage posted its second consecutive quarter of losses on Thursday, dragged down by lower fixed-income trading overseas and a slump in stock trading at home. 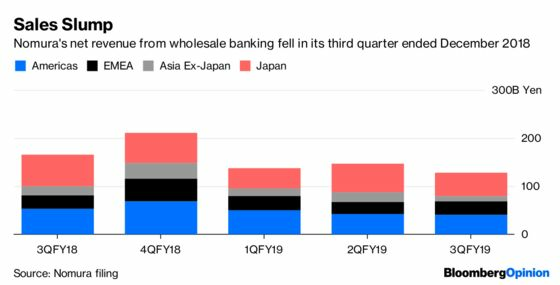 An 81.4 billion yen ($749 million) goodwill impairment charge in its wholesale business — largely overseas investment banking and markets operations — added to the gloom. With four straight quarters of pretax losses overseas, there’s no shortage of despondency. Yet Chief Executive Officer Koji Nagai and Chief Financial Officer Takumi Kitamura had nothing to say about job cuts. No word on the Financial Times’s report that Nomura is ready to cut as many as 50 employees from its global trading division, for instance. It wouldn’t be nearly enough anyway. Nomura is still bloated, even after a costly retrenchment resulting from the purchase of Lehman Brothers Holdings Inc.’s Asian and European businesses in 2008 (Thursday’s swingeing goodwill writedown was partly for that). Headcount was 28,280 at the end of December. That’s down from a 2011 peak of about 35,000, but barely changed from the 28,186 employees the brokerage had in March 2017. Times then were a lot better for fixed-income trading; Nagai was also reveling in the investment house’s first full year of overseas profit in seven years. The solution is to streamline and focus. That shouldn’t include fixed-income, where Nomura is a market leader. Everyone suffered in fixed-income trading in the last three months of 2018, including Goldman Sachs Group Inc. It’s telling that Deutsche Bank AG is adding 20 traders in its Asian fixed-income and currencies business as emerging market bonds recover amid the Fed’s dovish turn. Geographically, Europe remains a drag. A workforce of almost 3,000 is almost equal to those in Nomura’s Asian backyard (if back-office operations in India are excluded). That’s even after the firm exited European cash equities in 2016 to make Asia and the U.S. its focus outside Japan. The European cost base is even more glaring when you consider that quarterly net revenue from wholesale banking for the region (including the Middle East and Africa) was just 27.3 billion yen. That compares with 41.3 billion yen in the Americas, where Nomura has 2,384 employees. The fat isn’t in investment banking or trading. Around half of Nomura’s European employees are in corporate functions such as technology and risk management. Investment banking outside Japan remains a millstone, though. Nomura ranks 19th for equity underwriting in the Asia-Pacific region outside Japan, according to data compiled by Bloomberg. The firm was largely absent from the boom in Chinese IPOs in Hong Kong in 2018. Worryingly, Japan isn’t faring much better. The firm retained its top ranking for IPOs after underwriting the IPO of SoftBank Group Corp.’s telecom unit in December, but the quarter was a painful one for trading. Brokerage commissions slumped to 72.72 billion yen from 101.66 billion yen a year earlier. Nomura needs a presence outside Japan, just a smaller one. A bare-bones operation in Europe, where Wall Street rivals reign in investment banking, would be a start. The firm also needs a tighter focus on the kind of trading it does best. A strategic shift last year toward providing more structured offerings under the client financing and solutions businesses was a move in the right direction. Chipping away at the edges isn’t working. Nomura needs to wield the knife.